Have an iMac with a built-in VESA mount adapter? 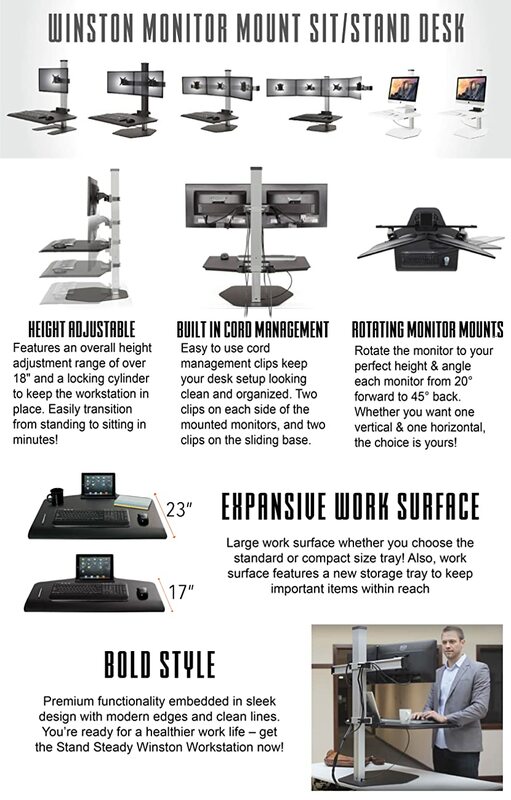 The Stand Steady Winston Workstation IMAC Monitor Mount Sit-Stand Desk Converter was built just for you. Available for one or two screens, it's a sleek, modern, and minimalist way to stand while you work. This standing desk converter takes up very little space while providing perfect monitor placement! IMAC COMPATIBLE: Works with an Apple iMac with built-in VESA mount adapter. Available in a one or two-screen version. Couldnt be happier with this workstation. Goes up and down easy, sturdy and functions beautifully! Being able to stand up for part of the day has taken away a lot of the back pain I was having.